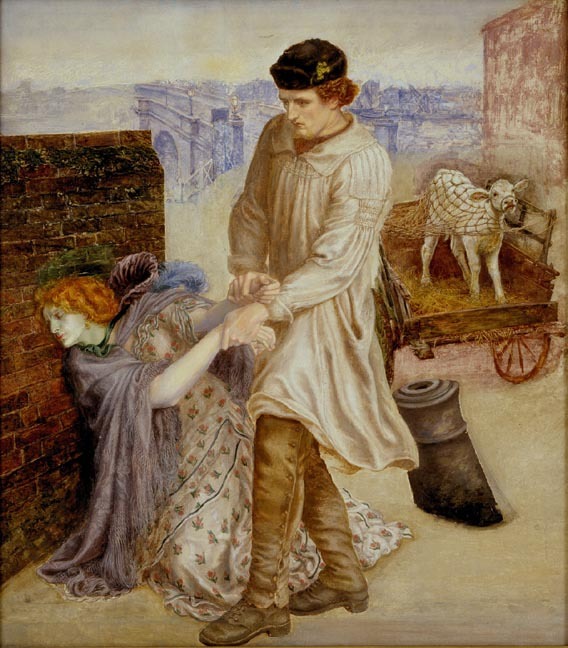 Dante Gabriel Rossetti spent 1850s in a mood of indolence and love; he was infatuated with Elizabeth Siddal, the beautiful red-haired Pre-Raphaelite model who famously posed for Millais’ Ophelia, and he mainly painted pencil drawings of Siddal and watercolours of idealised Medieval scenes. He wasn’t as productive in the early years of Pre-Raphaelite as he was in his later years when he filled his canvases with seductive, dreamy women with luscious full lips and voluminous hair; “Bocca Baciata” is the painting that started it all. The half-length portrait shows a woman dressed in an unbuttoned black garment with gold details, while the white undergarments coyly peek through. Her neck is long and strong, her head slightly tilted, lips full and closed, eyes heavy-lidded and gazing in the distance. On her left is an apple, and she’s holding a small pot marigold in her hand. She is full, voluptuous, strong, possessing none of Siddal’s delicate, melancholic, laudanum-chic beauty, but one thing they have in common: beautiful hair. 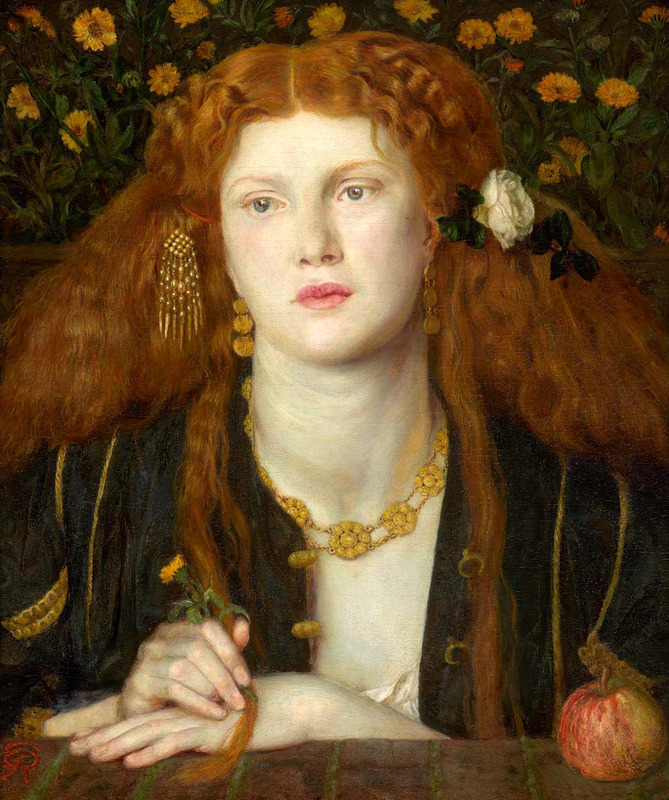 Model for the painting was Fanny Cornforth who was described as having “harvest yellow” hair colour, but here Rossetti painted it as a warm, rich coppery colour which goes beautifully with the orange marigolds and gold jewellery around her neck and in her hair. Rossetti must have borrowed the brush of Veronese himself when he painted those masses of lascivious wild hair that flows and flows, seemingly endless, ready to wrap itself around the neck of its victims. 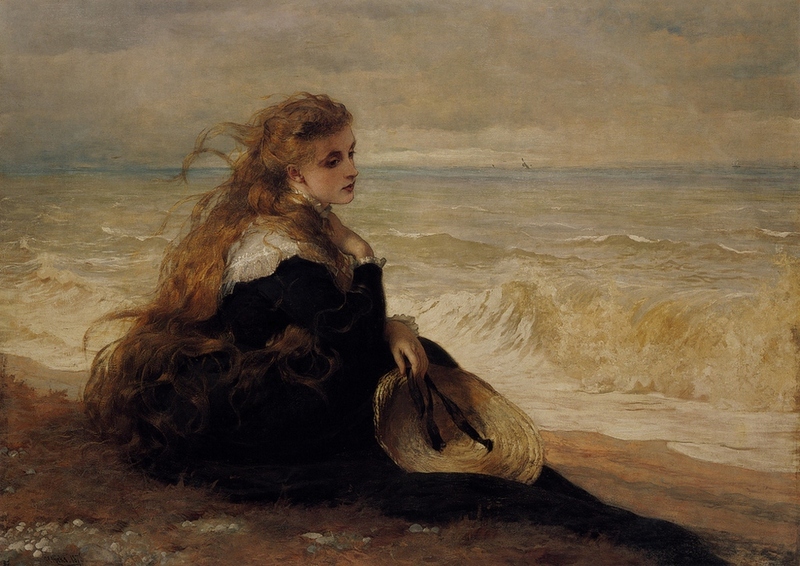 Gazing at Pre-Raphaelite paintings has taught me that the famous Victorian saying which goes: “hair is the crown of woman’s beauty” is wrong. Hair is not the crown, but the weapon, ready to seduce a man, ready to suffocate him in a matter of seconds. What lures me about this painting are the beautiful autumnal colours and pot marigolds that grace the background; they are the flowers which fascinate me the most at the moment. They are the birth flowers for October, appropriate because their orange colour matched that of the falling leaves, and in the Victorian language of flowers they are seen as the symbols of love and jealousy, pain and grief, but this symbolism saddens me. Why bestow such a negative meaning to such an innocent, bright, whimsical flower? Marigolds are known as “summer brides” because they love the sun and I love them; they are so modest and unassuming, you’d fail to notice them in the company of extroverted roses and overwhelming sunflowers, but they hide so much beauty in their small orange petals. The white rose in her hair symbolises innocence, and this portrait, although sensual, is indeed innocent compared to those which followed. As if the long, flowing fiery hair wasn’t enough, the title, Bocca Baciata, meaning “the mouth that has been kissed”, gives off a sensual mood. The beautiful expression comes from an Italian proverb from Boccaccio’s Decameron which Rossetti wrote on the back of the painting: “The mouth that has been kissed does not lose its savour, indeed it renews itself just as the moon does.” The line is a reference to a story from Decameron told on the second day, about a Saracen princess who, despite having numerous lovers, managed to persuade the King of Algarve that she was a virgin bride. “Bocca Baciata” is both stylistically and technically a transitional work. 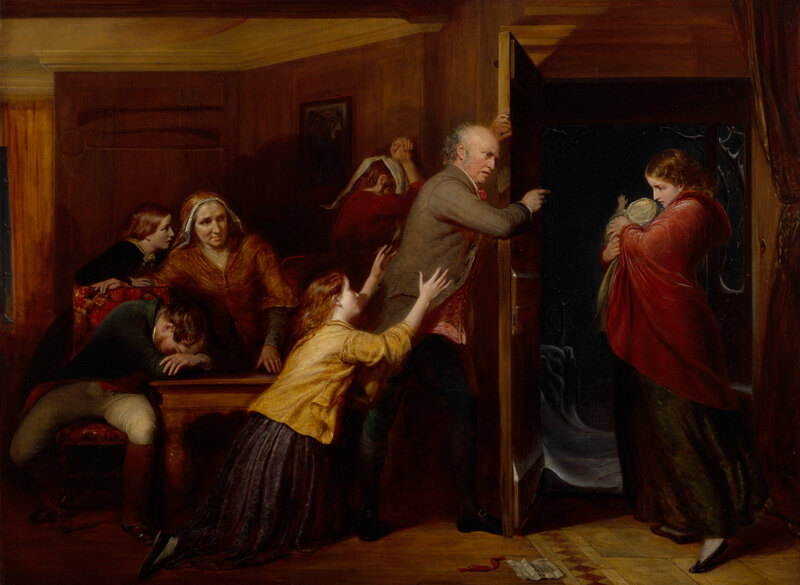 It is Rossetti’s first oil painting in years, the previous one being “Ecce Ancilla Domini” from 1850. The luxurious, sensuous mood is a reference to High Italian Renaissance, more specifically, the art of Titian and Veronese and their long-haired women. The main characteristic of Venetian art is the beautiful colour; space, volume is built with colour, not with line, and Rossetti used this principle hear, using soft shadings on the skin of her neck and in building the hair, stroke by stroke. Also, inspired by Titian, he used red colour as a base of his canvas, not the usual white. “Bocca Baciata” is not just a beautiful harmony of warm colours, but it also set a pattern of a style of painting typical for the art of late Pre-Raphaelite Movement and Symbolism, where a beautiful woman occupies a canvas, exuding sensuality, vanity and indolence, dressed in luxurious fabrics and surrounded by other objects of beauty such as flowers, mirrors, fans and jewellery. These types of paintings are not portraits with individual characteristics of a person, but a never ending series of visual representations of female sexual allure. 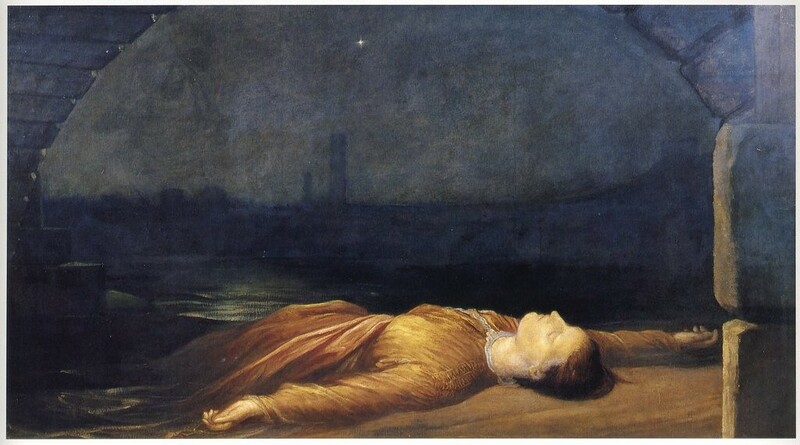 Painting ‘The Vale of Rest’ isn’t as famous as Ophelia, nor as vibrant and richly coloured as Mariana or The Blind Girl, but it is certainly one of Millais’ most atmospheric paintings, and also the one whose mystery can’t be solved despite all the details, symbols and hints, typical for early Pre-Raphaelite paintings. 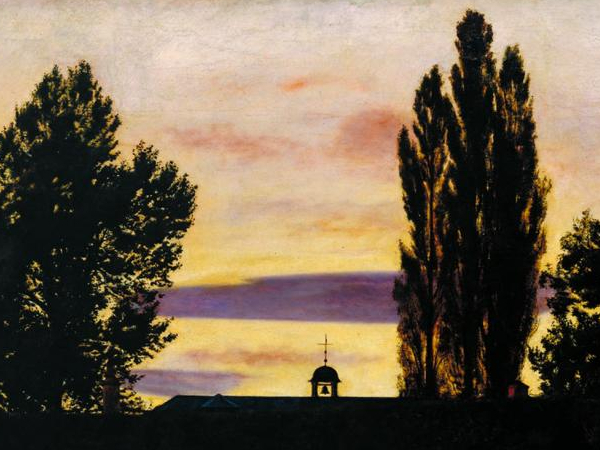 Roman Catholic nuns on a graveyard in the dusk of an autumn day. Mood of mystery, anxiety and secrecy. Dusk of a late Autumn day. Poplar trees are looming on the horizon. Tombstones coated in moss; names of the dead nearly erased with time, their lives now mere legends. Sky dazzles with purple, vanilla yellow and pink-lavender shades as chillness descends in this walled enclosure. A contour of a low chapel with a bell. Two Roman Catholic nuns. 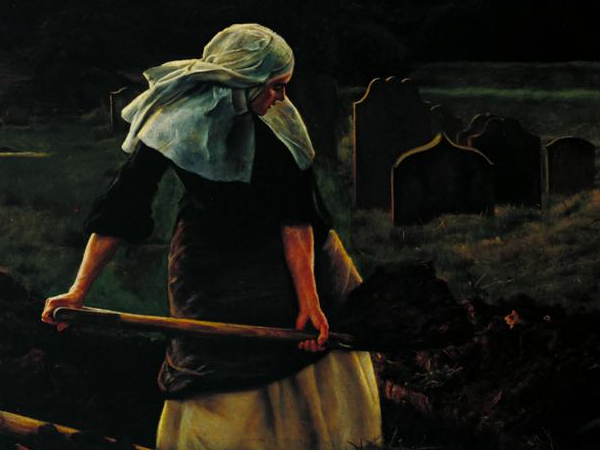 One digging a grave, the other – observing with a worried look on her face, and clutching a rosary in her hand. 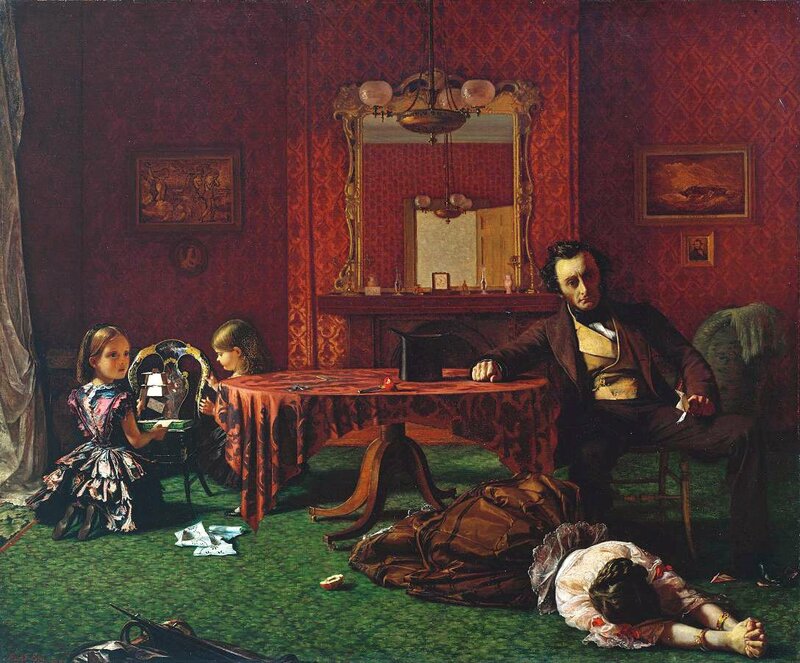 Art critic Tom Lubbock said of the painting: ‘Corpses, secrets, conspiracy, fear. 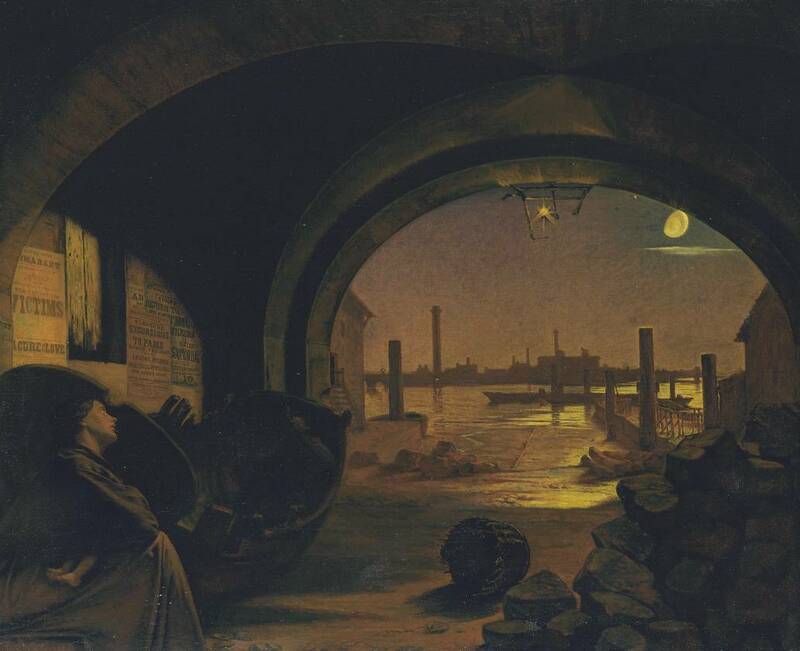 It’s a picture that pulls out all the stops.’ The whole scene evokes mystery. Why is the nun digging a grave? Is it a burial, or an exhumation? What secrets are they hiding, and whose body lies in the cold, dark soil. 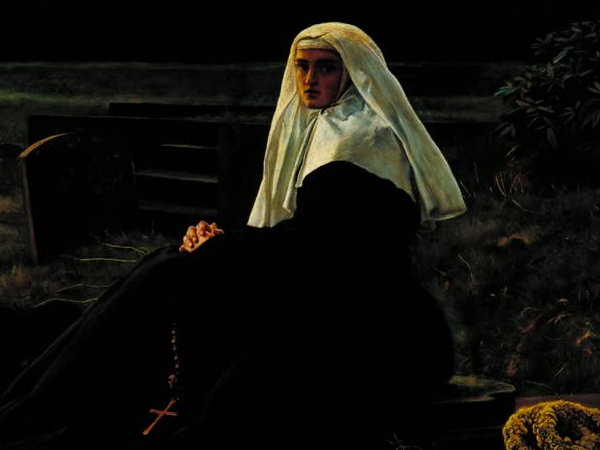 Then the subject of Catholic nuns – still an object of scepticism in Victorian Britain. Millais intended this painting to be a pendant to Spring or The Apple Blossoms (1856-59) where the subject of death is only hinted, but here it is fully exposed. There’s a skull on the nun’s rosary, and in the sky there’s a purple cloud vaguely shaped like a coffin – a harbinger of death, according to a Scots legend. 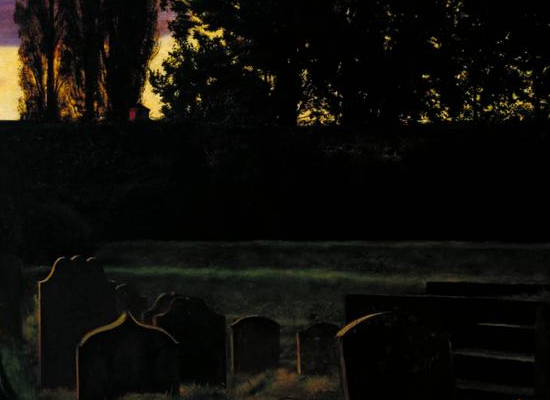 As if the sight of a graveyard in the dusk isn’t unsettling enough, Millais incorporated these little morbid details. 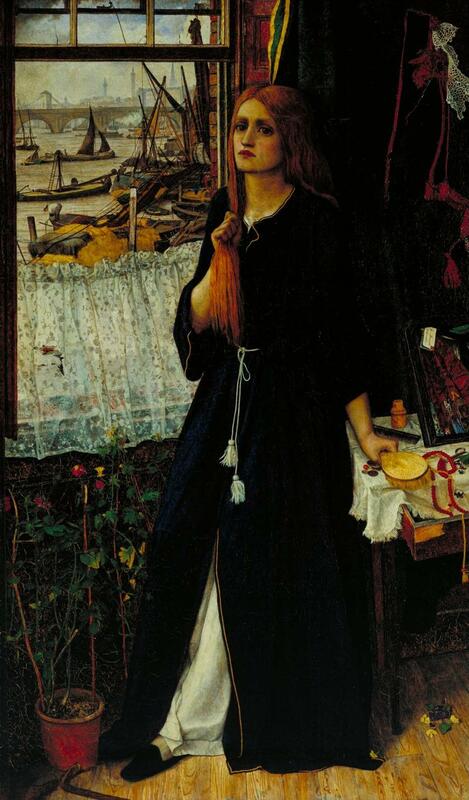 As you can see, the Pre-Raphaelite paintings are like books, you can read them by observing the details and symbols, which can always be interpreted in a different way. Millais painted the sky, trees and shrubs sitting just outside the front door, in the garden of Effie’s family at Bowerswell, Perth. Effie said: ‘It was about the end of October, and he got on very rapidly with the trees and worked every afternoon, patiently and faithfully, at the poplar and oak trees of the background until November, when the leaves had nearly all fallen.‘ The grave and the tombstones were painted a few months later at Kinnoull old churchyard in Perth. There’s a funny story connected to it. 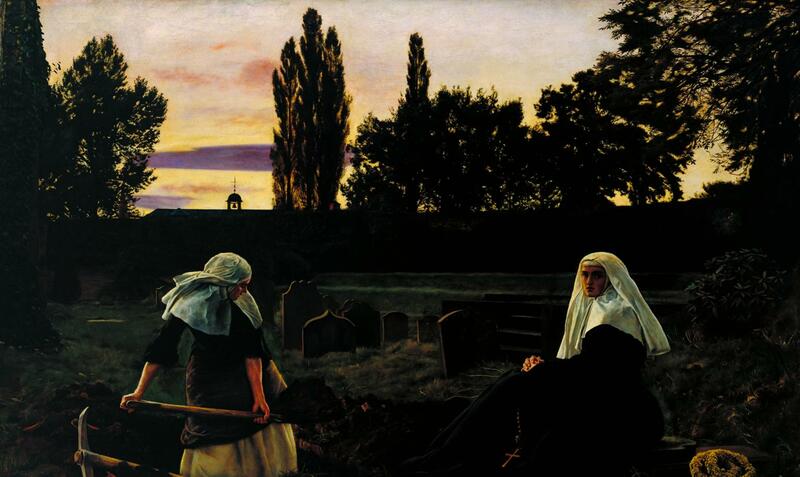 So, as Millais was painting at the graveyard daily, two strange or ‘queer’ bachelors, known by the names ‘Sin’ and ‘Misery’, noticed him and assumed that he made a living by painting the graves of deceased persons. So, they brought him wine and cakes every day, to reward his everyday hardships. 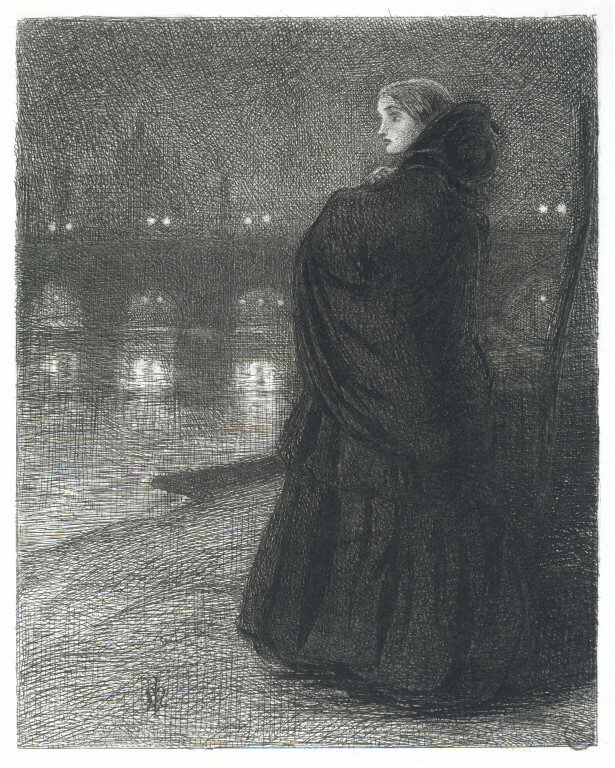 To end this post, I have to say that Millais is, in my opinion, the master of painting dusks and capturing moods and psychological states in a lyrical way; in Mariana, he portrayed her longing and loneliness, and even here you can sense a certain tension, or a deeper emotional connection between two nuns, even perhaps a game of power; while one is digging, tired, with rolled up sleeves, the other sits calmly, though her direct gaze at the viewer reveals anxiety and worry. 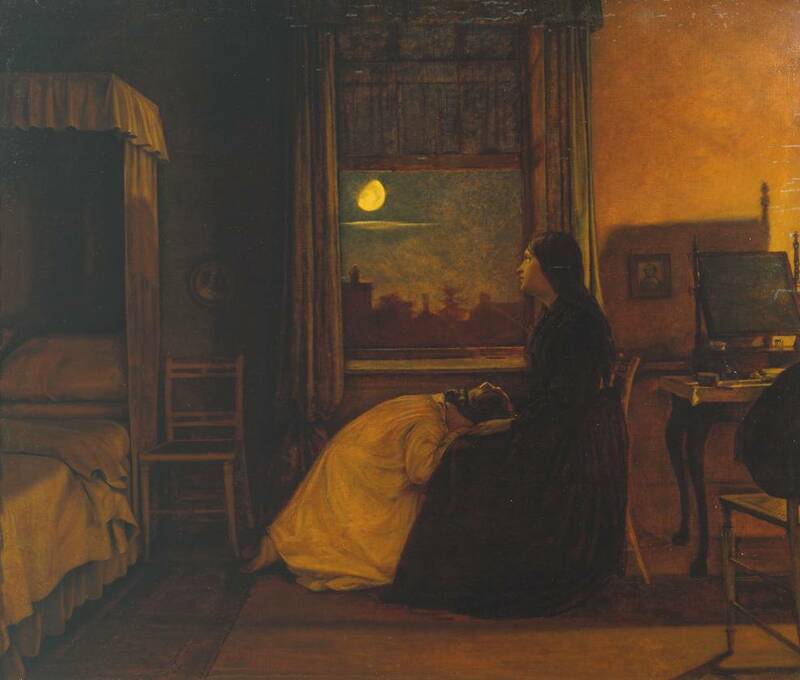 Millais perfectly captured the colours of an autumn dusk; even softening the gold and purple, according to Effie. In ‘The Vale of Rest’, he perfectly captured the mood, just like he did in his painting ‘Autumn Leaves’, 1856. Still, after analysing this painting, and observing its every detail, every symbol and every brushstroke, I can’t solve the mystery behind it. Perhaps it was never meant to be solved, but enjoyed. And I certainly did; drowned in its dusky mood and morbid, doomy beauty.